A desktop application that can help users create and manage projects using the familiar Microsoft Office Ribbon interface. 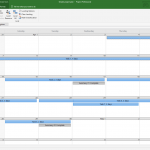 Microsoft Project is the classic project management application that is really unto itself since it is so unlike most of the competition, which is primarily web based. Project, meanwhile, is all about the desktop, and is part of the extended Office suite. 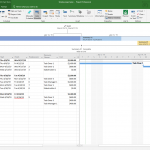 Looking at Project, you are immediately reminded of Excel, with its spreadsheet-like task entry bar and a familiar green tone. At first, Project may seem overwhelming – indeed, it has just as many options as other Office products. Once you get the basics down, however, it’s relatively easy to understand, with a wealth of interfaces including timeline, Gantt charts, calendar, and board views. Project also has a companion web app – like many Office apps – but the primary interaction is the desktop, which may not appeal to smaller, web-focused teams. A lot of the popular options for project management software are web apps that you access in the browser. Yet Microsoft is still making a desktop version of Microsoft Project, which is ideal for users who prefer a more traditional approach. Project does have a web app like the others, but the main focus (as with many Microsoft products) is an Office program that runs on the desktop. Microsoft Project first debuted in 1984, making it the oldest project management tool we’ve looked at. It’s also officially part of Office, though you won’t find it on the Office 365 landing page since it’s geared towards enterprises and other large organizations. If up until this point you’ve been organizing your projects in an Excel spreadsheet, then Project may be an easier transition than something that is purely web based, such as Asana or Trello. Project is much more expensive, however, with narrow pricing options – the lowest tier, for example, starts at $30 per user, per month. The first thing you notice when you open a fresh Microsoft Project document is that it shares a lot of “DNA” with other Microsoft Office products. At the top is the familiar Office Ribbon, with menu options geared towards project management such as Task, Resource, and Report. Towards the bottom, you see a grid for entering tasks that is very reminiscent of Excel. But that’s where the similarities end, as Project is all about managing your team’s efforts with Gantt charts, resource allocation, milestones, and a wealth of reporting options. One of the most helpful features in Project has to be the auto-scheduling feature. Project expects you to define your projects in a certain way with summary tasks, followed by sub-tasks, as well as milestones. Once you’ve entered the scope of your project and defined time frames for your tasks, auto-scheduling can automatically plan a calendar for all your tasks. You could enter your own dates manually, but auto-scheduling offers a more manageable flow on Project’s timeline and Gantt chart views. 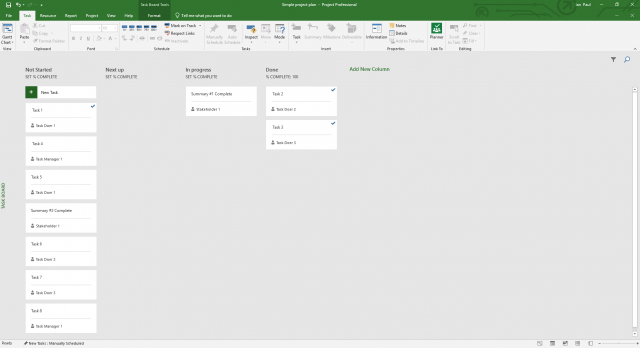 Microsoft Project has a Kanban card and board view that is accessible via Task > View > Task Board. By default, it offers four predetermined columns: Not Started, Next up, In progress, and Done. You can also add new columns to suit your company’s workflow, rename the default columns, or delete them altogether. Like other Kanban boards, this is a drag-and-drop interface. You can also create tasks right from this interface, as well as add key information such as resources and notes. Like many other project management tools, you can add notes and attach files to your tasks in Project. But in true Microsoft fashion, it uses annoyingly uncommon terminology. Double-clicking on the information cell on any task calls up a small Task Information window with six tabs. Under the Notes tab, users can jot down small rich text notes about the task. In this section there’s also an Insert Object option, which is where you can attach a Word Document, Excel spreadsheet, PDF document, image file, and so on. It would be a lot easier to understand if this option was just called “Attach,” but like many other Microsoft products, Project has its legacies to be aware of. 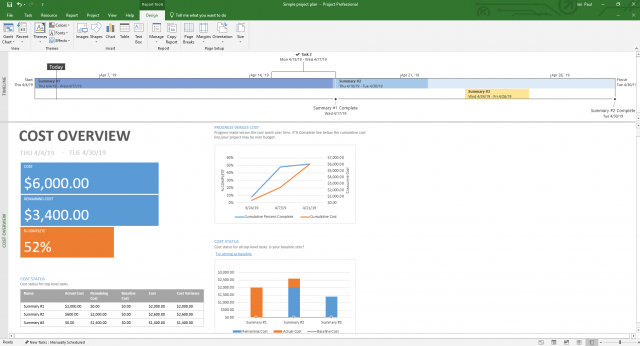 Forget about sub-tasks – Microsoft Project lets you embed projects within projects. This is a nice option for anyone who needs to create a master file to track multiple related projects. Once you’ve linked a sub-project to a master project, you can make changes to the former inside the latter. In addition, any changes you make inside the sub-project file will be reflected in the master project. It’s a handy feature for getting a high-level view of your projects. 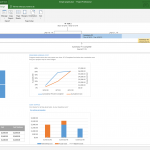 This third-party video offers an excellent overview of how Microsoft Project works, including creating new projects, adding tasks, and viewing reports. 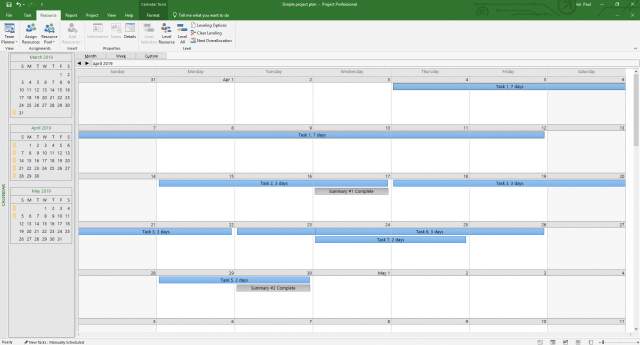 Microsoft Project is not available as a free version, which isn’t surprising given how very few Office applications are (save for the most popular ones). As we mentioned earlier, pricing starts at $30 per user, per month for Project Online Professional. This pricing tier supports team member collaboration, the ability to submit timesheets, the desktop app, web app, and cloud saves. The next tier is Project Online Premium for $55 per user, per month. This pricing tier adds advanced analytics, a standardized process for capturing and evaluating project ideas, resource allocation optimization, and portfolio reports. 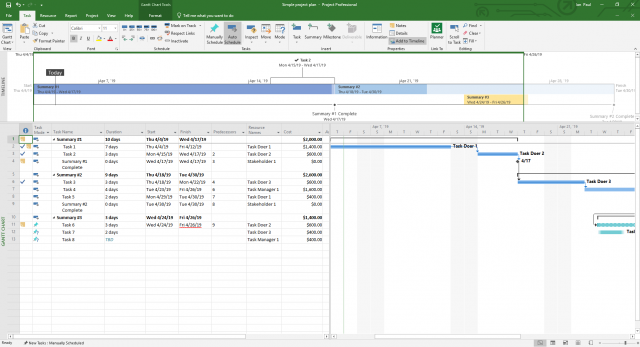 There is also a Project Online Essentials option for $7 per user, per month; however, this option is an add-on for Online Professional and Online Premium subscribers who want to add team members that only have access to the Microsoft Project web app. Microsoft also sells Project as an on-premise solution, starting at $620 per PC for Project Standard, which lacks any online collaboration. Project Professional starts at $1,030 per PC and does support online collaboration, as well as collaboration over Skype for Business. There’s also Project Server, which doesn’t publish a set price and adds advanced analytics, as well as the standardized capture and evaluation process mentioned with Project Online Premium. There’s no doubt that Microsoft Project is a very capable application with all the features required for project management. That said, this probably isn’t the ideal choice for smaller, nimbler teams. First of all, it’s very staid in its look and feel since it’s a pure Office product. It is absolutely feature rich to the point of being overwhelming, but it hides all that dynamism behind the usual Office exterior. Simply put, you can find far easier and more welcoming interfaces to manage projects for smaller and mid-sized teams. Secondly, Project doesn’t have lower priced tiers, making this product out of reach for some – though to be fair, it probably should be compared to the upper tiers of other project management tools, which hide key features behind higher priced offerings. If your company is already highly invested in Microsoft Office, then Project is a natural extension of that investment. But if you’re not interested in Office, then Project is not an ideal choice for you – regardless of how feature rich it might be.